It's got a spectacular name, but Sugar Bytes' filter plug-in is most notable for its mightily impressive sound. We thought we'd seen and heard it all as far as filters go, but WOW raises the bar once again. Brilliantly authentic filters. Modulations galore. Envelope follower is great fun. Step sequencer rocks. Good selection of useful presets. We'd like more vowels. Some might not pay this much for a filter. Filter plug-ins aren´t exactly thin on the ground, but there are few out there that sound as good as this one. 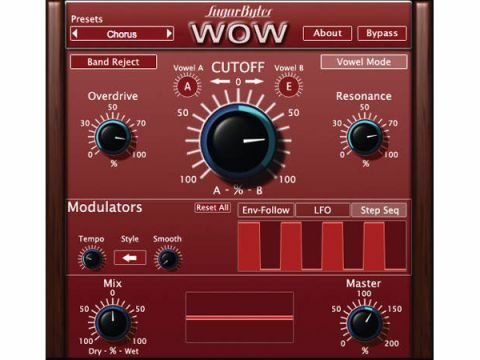 WOW is a cross-platform plug-in that´s available in VST and AU formats, and it´ll set you back a modest €79. It´s offered as a download, and copy protection consists solely of a serial number. Most of WOW´s features are immediately apparent on first glance. The GUI is dominated by the immense Cutoff knob, which, in turn, is flanked by Resonance and Overdrive knobs. Nothing terribly surprising, then. These controls are shared by the currently selected filter mode, of which there are no less than ten variations from which to choose. Filter modes are selected from a drop-down menu, and range from typical low- and high-pass models to the more esoteric likes of the Comb Filter and Band Crusher modes. Once you´ve picked a filter, you have all sorts of options for tweaking its parameters. WOW sports a minimal but wildly versatile selection of modulation sources. You can call upon an envelope follower, an LFO and a step sequencer. All of these are available simultaneously and can modulate one another as well as the usual filter parameters. The LFO and step sequencer are fairly ordinary in design and can be synchronised to the host tempo. The LFO offers Rate and Sensitivity controls and enables you to select any of seven different wave shapes. Interestingly, it can also be retriggered by the incoming audio signal. The step sequencer boasts a smoothing function and a handful of playback styles. One of the more intriguing techniques we stumbled upon involved using another mod source to modulate the sequencer´s Smooth parameter while the sequencer was used to tweak some other function. Finally, the envelope follower can be used to track the dynamics of the incoming signal and use it as a mod source. You can determine the frequency range, attack and release times, as well as the overall gain. It can be used for all manner of effects, from auto-wah to pumping, filtered dynamics. Clicking the Vowel Mode button will transport you away from the familiar analogue-style filtering and into the realm of the formant filter. Once an exotic rarity, it´s becoming a more common tool these days, enabling your filter bank to ‘speak´ by imparting the character of the human voice. Since your mouth and throat are really just resonant cavities, by pushing air through them and changing the shape and size, you´re altering the resonant frequency of the cavity through which that air moves. This is easily replicated using formant filters, such as the one found in WOW. Using the Vowel Mode, users can sweep through a pair of selected vowel shapes. U, UE, O, OE, A, A:, AE, E and I are all on the menu. This is cool stuff, though we can´t help but wish that it was possible to use more than two vowels at a time. We have to admit that we were initially a bit nonplussed at the prospect of reviewing yet another filter plug-in. However, Sugar Bytes has delivered one that´s inspiring to use and sounds fantastic, with an excellent, wide-ranging selection of presets. The cost is easily offset by the quality of the filter algorithm, which is one of the most authentic we´ve ever heard.